The most anticipated and citing new development in Big Time RFBR today, is the possibility of these new DiOrio, MD-PAS triple pistols, for the masses. 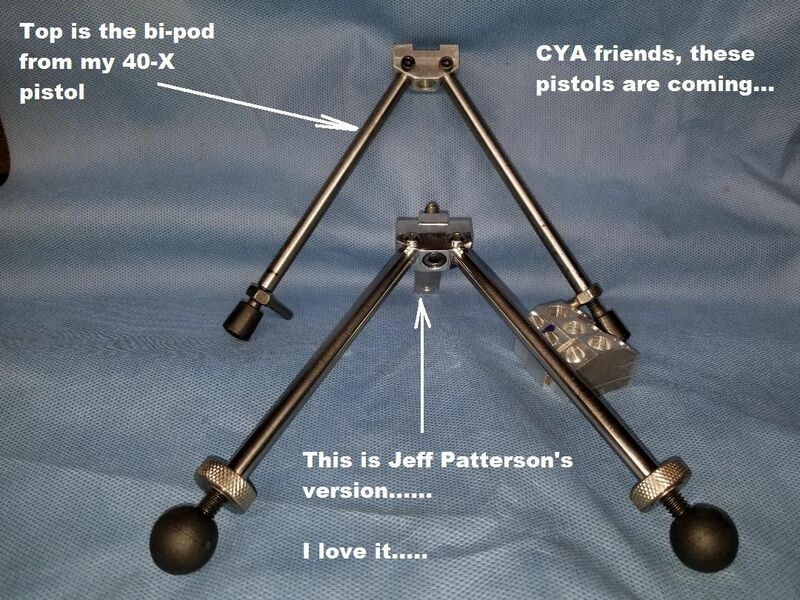 I just received a picture of Jeff Patterson's new bi-pod for these new pistols. Jeff, it's awesome.......I hope you find time to produce them, cause there's about to be a demand. Last edited by Bill Calfee; 4 Weeks Ago at 10:07 PM. Here I'm busy looking at the bi-pod itself and didn't notice the three sets of aluminum hardware for the rail attachment to the right of the legs. Unless Jeff's getting ready to build himself four pistols it looks like he will be producing these bi-pods, although I'll have to confirm that. Jeff told me he's going to first try a different set-up for placing the bi-pod feet on the bench, rather than using rubber feet resting on the Eley ammo trays. He said he's going to try Delrin ball feet resting on a hard smooth surface. CYA friends, this is what's going to be so kool about these pistols, folks will try different methods of dealing with the bi-pod/bench top. If what Jeff is doing doesn't pan out, he can always go to the rubber feet on the Eley trays, or, like I used to do, have the rubber feet resting on a sheet of material that in turn rests on a flat base plate. The idea here, and it works great, if for the rubber feet to grip the thin top sheet and allow it to slide on the base plate. By the way, the base plate needs to have three thin pads under it, so it can't possibly rock on an uneven bench top. One of my base plates has three round pads made from 80 grit wet or dry sand paper....and works great. Anyway, it's going to be fascinating to watch the creativity of folks with these pistols. Last edited by Bill Calfee; 4 Weeks Ago at 05:33 AM. You need the right weapons for the coming revolution. I whipped this one up with my right hand (I'm left handed) while watching a basketball game, playing chess, and writing a letter with my eyes and my left hand. Granted it still needs a tip on one of the long legs, but you can only do so much in fifteen minutes especially when you're not looking. 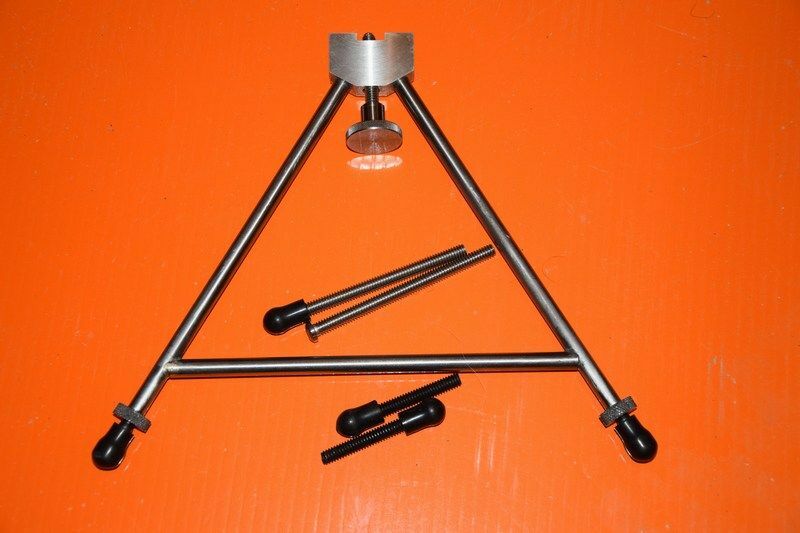 This has the cross brace as you notice and the stability is readily apparent. There's a minimum of seven inches lift from the base. Probably about 6 1/2 considering the forward angle. The longer legs provide a max of about 91/2 inches. It should work well for the owner who has one that covers about 5 inches. I can't say who really made it. He said he's not in the business. Last edited by wsmallwood; 4 Weeks Ago at 09:43 PM. There's a bunch of folks with ideas mulling around in their heads about these pistols. I'm right handed, so what bolt/port configuration will ultimately work best? I spent my entire shooting career shooting a right/right XP pistol. And I felt in no way handicapped.....but, of course, I had no choice in the matter. But, until I actually get it completed, and actually get to fool with it, I can't be sure whether I'll like it better, or not. There's one thing for sure, since it's a 10-X based triple lug action, if I don't like it, I'm stuck, since I can't dual port it since 10-X removed the backbone of the action with their loading port configuration. Which means the spacer's attachment method would have to be as strong as the rest of the action, which would be a nightmare to execute. The spacer for this 10-X action only needs to hold the recoil lug for the trigger linkage...since the action is long enough for the front bedding, as is. But they do have the "classic" look of a Class A RFBR pistol. A proper center grip stock, for the masses, will have to be developed, and there's folks doing that as I type this. 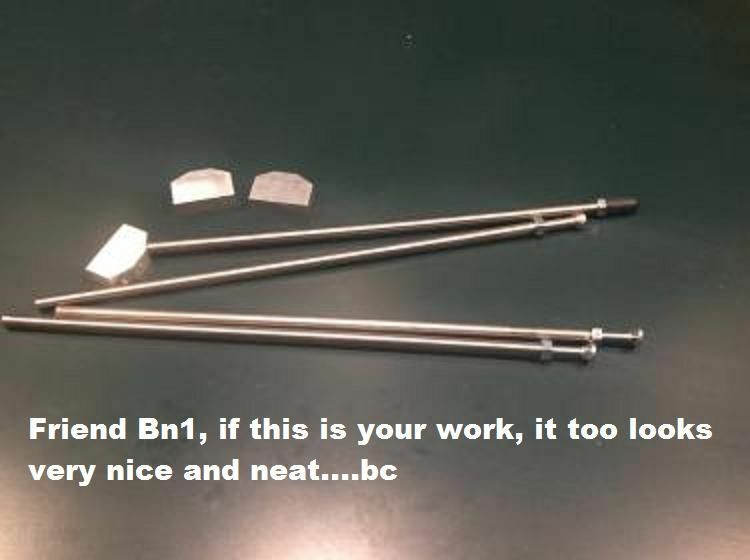 Friend Bn1, if you did the bi-pod in the picture Wally posted, that is nice work. Last edited by Bill Calfee; 4 Weeks Ago at 03:16 PM. Last edited by Bill Calfee; 4 Weeks Ago at 03:25 PM. Yes, whoever did Mr. Smallwood’s bi pod did really nice word with some good innovations. I’m not going to cut the legs to length until I have the stock. The legs are 5/16”. .049wall 604 stainless steel tube. I don’t have a lathe, so I coildn’t Bore the end of solid stock. By the looks of the recent pictures posted, it looks like bi pods will not be much of a problem for those putting pistols together. I’m sure as other issues/needs come up someone will post pictures and solutions. I’m having a good time, thanks for your forum! Come on people....it’s show and tell time. Last edited by Bn1; 4 Weeks Ago at 07:37 PM. It looks like the aluminum saddle is rounded in front......kool! I told you once that I couldn't draw a stick man. I sure couldn't draw that even though it is just angles, but it would require me drawing convincing feet and knurled bolts. Couldn't do it. It's real, and will be in action shortly. I just can't tell who did it because as he said "I'm not in the business" but looks like many people are jumping in. I really like the knurled attachment bolt.........do you know if the maker of this bi-pod made it captive with the aluminum saddle? To have it captive with the bi-pod would be the koolest thing ever. Last edited by Bill Calfee; 4 Weeks Ago at 01:04 PM.